Blending the best of the Cornish countryside, coast and history. 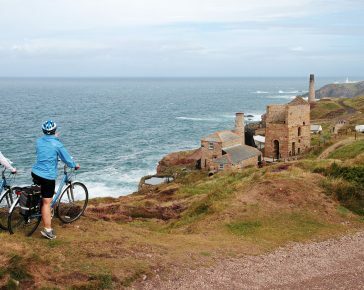 Starting from Porthleven in the west of the county, the West Cornwall Tour combines stunning coastal cycling with stops in beautiful seaside towns including St Ives, Penzance and Falmouth. Electric cycle hire: Add £160 per person. Check in for your first night’s accommodation at The Harbour Inn, Porthleven. 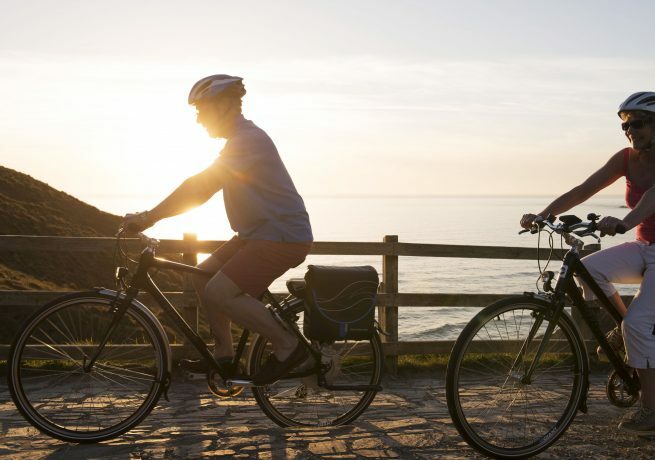 If you are hiring a cycle for the tour we will set you up and make all the necessary adjustments in the afternoon, to ensure you are ready to go in the morning. 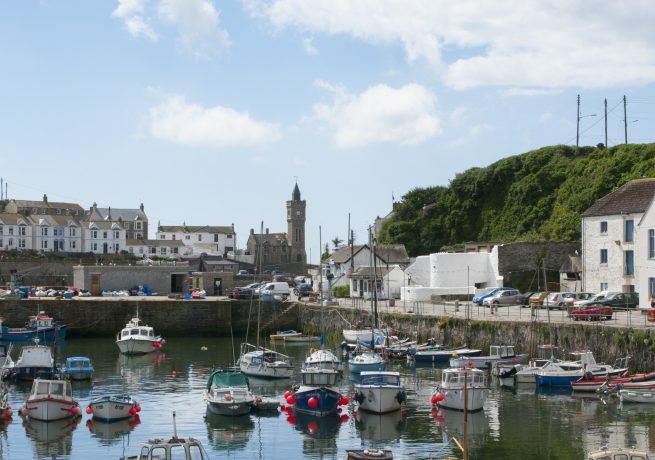 Fishing village Porthleven is home to lots of shops, pubs, art galleries and cafés to explore. Enjoy fish and chips on the beachfront, or visit one of many restaurants for dinner, such as Cornish-Asian style restaurant Kota Kai. The Harbour Inn, Porthleven The Harbour Inn is a lively pub situated on the harbour in the small Cornish village of Porthleven. The Harbour Inn has 14 rooms in total, each featuring a telephone, television, tea and coffee making facilities and a hairdryer. All the food served at The Harbour Inn uses fresh local produce and there is also entertainment in the bar on Saturday evenings, with a fun quiz night on Thursday evenings. From Porthleven you cycle along coastal lanes to the seaside village of Marazion, which affords breathtaking views over St Michael’s Mount and Mount’s Bay. From Marazion there is an easy, level ride around Mount’s Bay to Penzance and neighbouring Newlyn. Both towns have large harbours and big fishing fleets, so there is always plenty going on here. It’s also an ideal place for lunch. The tour follows the coast road to Mousehole, a cosy fishing village with real charm and character. 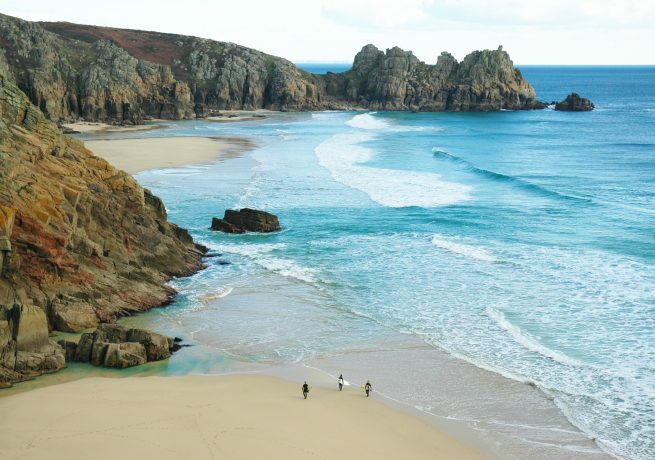 Porthcurno is home to the Minack Theatre – a unique place where the auditorium and stage are carved into the cliff above the sea. Performances are held here throughout the summer. 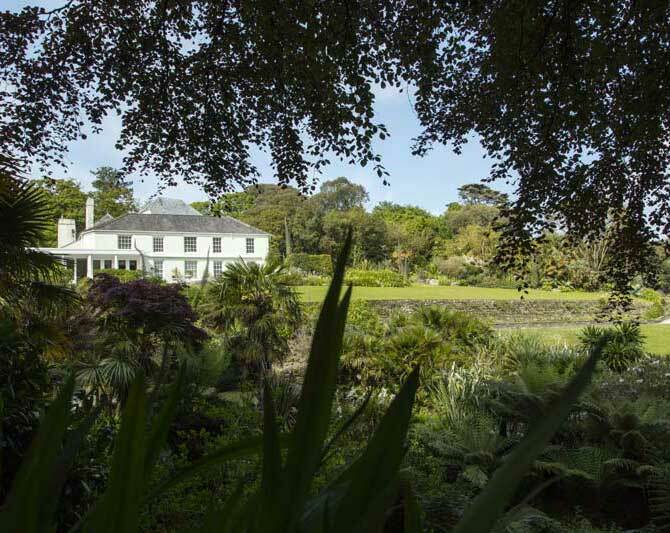 Rockridge House, Porthcurno Nestled deep in the beautiful valley cove of Porthcurno in South West Penwith lies Rockridge House, a luxurious family home offering wonderful bed and breakfast accommodation for all the family, with a selection of doubles, singles and family rooms available. From Land’s End, England’s most westerly point, it is possible to see the Isles of Scilly on a clear day. Then it’s on to one of Cornwall’s ancient mining districts, St Just. Leaving St Just, the tour follows lanes which hug the clifftops of the north of Cape Cornwall and Poldark country. The area’s mining heritage is clearly visible here, with engine houses and ruined mine workings still standing at Botallack and Levant, and the Geevor Mine museum at Pendeen. The route then takes you through National Trust land at Rosemergy, Porthmeor and Gurnard’s Head to the village of Zennor, where the nearby Logan Stone is worth a detour. Then on to St Ives, which is well known for its artists, the Tate gallery and the Barbara Hepworth Museum, as well as being home to some great restaurants and a picturesque harbour. The Queens Hotel, St Ives The Queen’s Hotel is a late-Georgian, three-storey building in the heart of picturesque St Ives. Eight en-suite bedrooms have been redecorated with vintage furniture and Cornish artwork hanging on the freshly painted white walls, plus sparkling new bathrooms with new showers. Downstairs is a relaxed and friendly bar with delicious pub food made from the finest local, seasonal ingredients Cornwall has to offer. 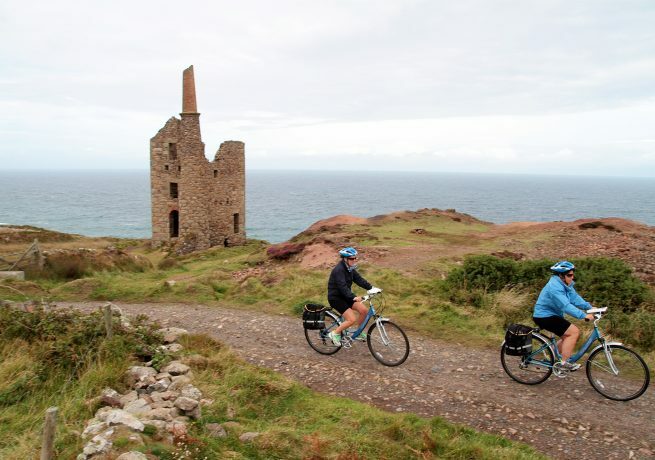 After leaving St Ives you will head towards Hayle and take the Engine House Trail, a dedicated cycle track which links the many engine houses dominating the landscape, and cycle through the town of Camborne, the location of the last deep working tin mine in Europe. The tour continues through Redruth and on to Devoran before catching the King Harry Ferry across the Carrick Roads to the Roseland Peninsula. The final leg of the day takes you to St Mawes, where you will catch another ferry to Falmouth, home to the deepest natural harbour in Europe. The Gyllyngvase House Hotel, Falmouth Gyllyngvase House Hotel offers quality accommodation and all the facilities of a small hotel. 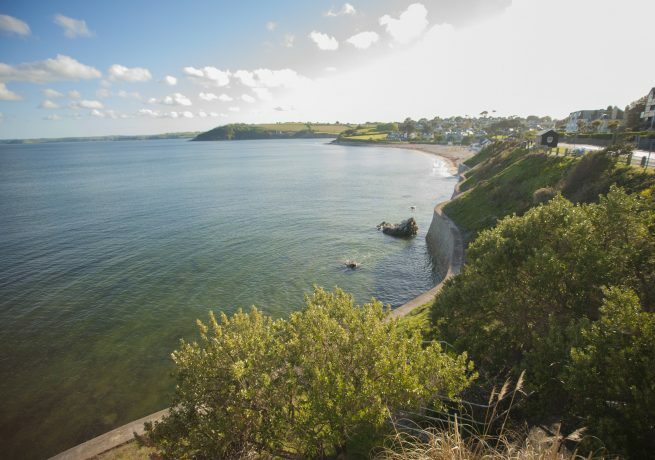 This is a friendly, family-run hotel, situated 200m from the seafront at Gyllyngvase beach with Falmouth town centre and historic harbour just a few short minutes walk away. The hotel has thirteen bedrooms, comprising of doubles, twins, family rooms and singles. Paul and Emma Lower are the proprietors of this family run hotel and will personally supervise all your arrangements during your visit. Option to vary route: With the last St Mawes to Falmouth ferry leaving at around 5.15pm, cyclists have the option to stay overnight in St Mawes if they would prefer a more leisurely day. Alternative accommodation is in The Victory Inn, St Mawes, and has a surcharge of £25 per person. Situated in Pendeen village on the dramatic west coast of Cornwall, Geevor Tin Mine is one of the largest preserved mine sites in the UK. Inspiring art and breathtaking scenery team up at Tate St Ives. 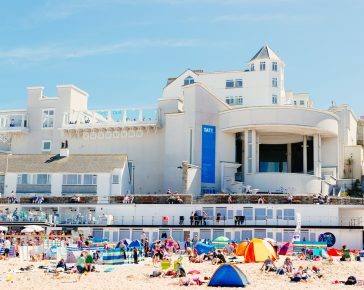 The iconic gallery overlooks Porthmeor Beach and exhibits work by modern British artists. This 26 acre subtropical paradise features a fantastic coastal backdrop, and is rated among the top 80 gardens in the world.